Here’s another quick post about a recent Revamp! I don’t even have an original blog post about this game because .. well, because I wasn’t super proud of it when I posted it originally. A little color, a lot of color, some amazingly fun fonts by Kimberly Geswein, a lot of time and a little love make this product what it is. When you purchase this game, you get two versions…. a Pre-algebra version and an Algebra 1/2 version. You could also use both versions to help with differentiation! It’s super easy to add cards into the game or take them out. You could also just target certain properties for one game if you chose to do so. So, here’s how the game works. (Think Cranium…) The student rolls a die and sees what place they would land on (they DO NOT move their marker). 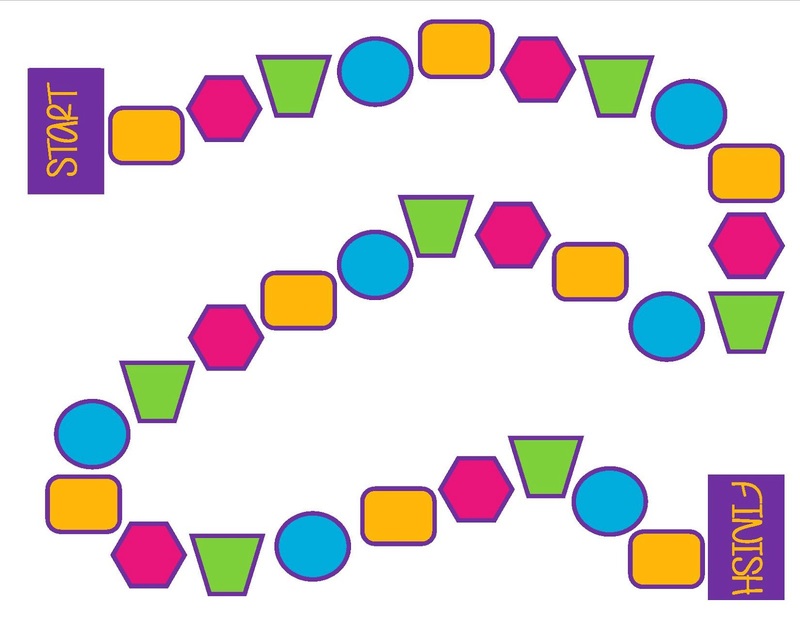 The shape/color (I made all the same shapes the same color incase you wanted to print in black and white) each represents a different mini-game to play. Represent It — Draw a picture to represent your property. You may not draw an example of the property. Build It — Create an example of your property using only numbers. and WILD CARD — player’s choice of which of the three mini-games they wish to perform. Example: Student A lands on a pink hexagon so they must play Represent It. They choose a property card and do not reveal it to the rest playing. Student A must draw a picture to represent the property on the card without drawing an example. For instance, for Commutative Property, they could draw a picture of a car driving to work and back home. If the teammates guess the property correctly, then Student A moves to the pink hexagon. If they do not guess it correctly, Student A remains at the original location. Also, I made two game boards. Once with a fancy background by Amy Alvis and one with a plain white background to use less ink I also made sure that the symbols we based on the shape not just the color so that you could print in black and white if you prefer. edit: AWESOME suggestion from 4mulafun!!! Categories: mathematical engagement, mathematical reasoning, number and number sense, and patterns, functions and algebra. I love this! So hard to find fun activities for properties. I would love to use these in my centers! Congratulations Roseanne! You are one of two winners of my Property Progression game! I will email it to you shortly! Thanks so much for stopping by and being such a huge support! What great idea. I really love how it makes them think about what the property is with the picture, example, and describing. Too often students get in the habit of just memorizing definitions and they forget to really think about what the terms mean. Thanks, Lisa! Memorizing properties really becomes an issue when you throw in the “not a property” possibility in higher levels and when you start proof! Thanks so much for stopping by and being such a huge support! This is great! I love that there are three ways in which to answer each question. Surely someone in the team of players is stronger at one type or another and can help their teammates out. Makes for a great cooperative group activity! Thanks so much Brook! I really like how the revamp came out! I plan to make more differentiated games as well 🙂 Thank you for stopping in and for all of your support! Thanks Amy! 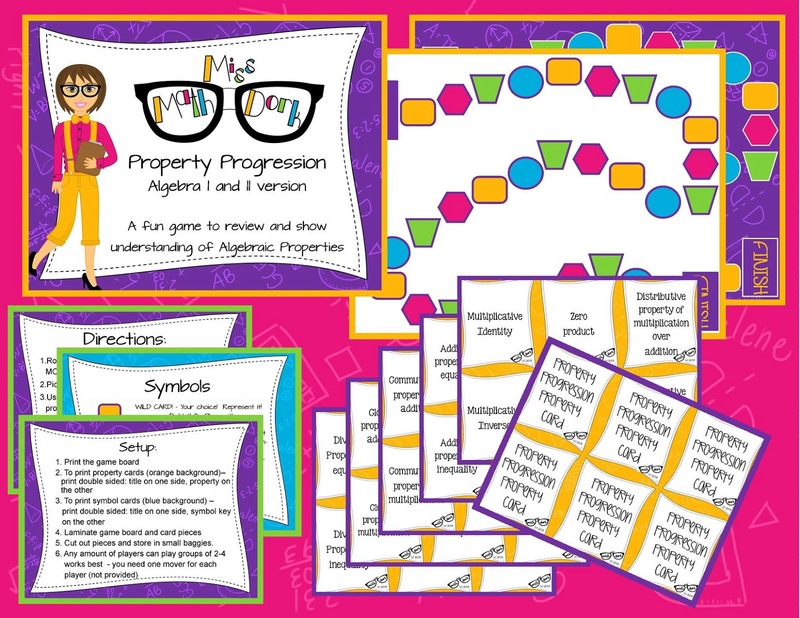 I plan to make more differentiated games and task cards in the near future! Thanks so much for stopping in and for all of your support! Sounds like a great game. I like that the players have to describe the properties using words, pictures, and examples. Thanks so much, Stacy! I had a ton of fun making this one! What a fun game! I’m totally impressed. I especially like the variety of skills covered:) my students really struggle with properties (even when I mention them everyday!). I think this would be a great way for them to practice, but while having fun! Congratulations Stephanie! 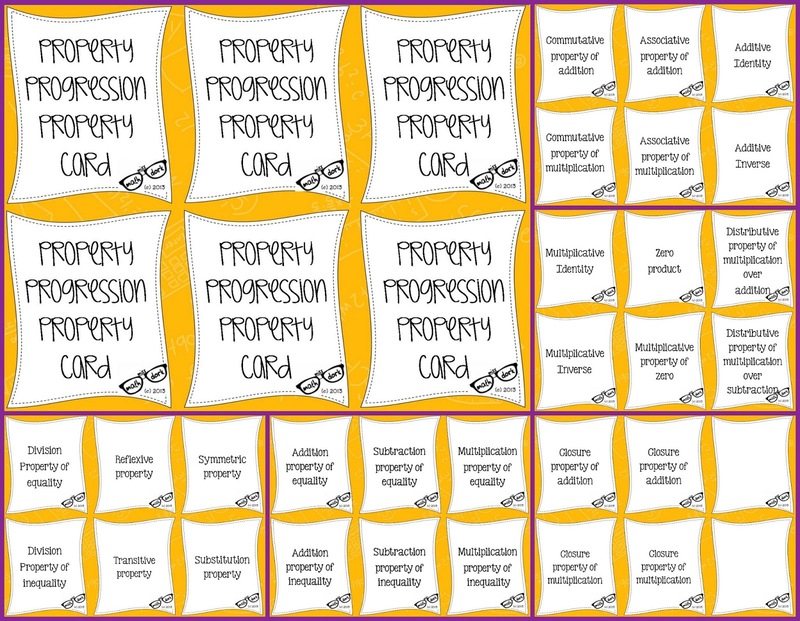 You are one of two winners of my Property Progression game! I will email it to you shortly! Thanks so much for stopping by and being such a huge support!